Against the biting December wind, I sought refuge, macchiato, and custard pudding in a little Dalston coffee shop. Inside, the walls were a calming white, the music was ambient and floaty, the tables were propped up slabs of reclaimed wood. But something was amiss. There was something disturbing here. On the walls, a woman in a stylish pant suit reclined upon a dish of sweetmeats, her face eclipsed by an avocado; a wedding dress is bisected by a flan, a succession of Janus-faced models find various facial organs replaced by mouths, butterflies, and other alien appendages. Pitched somewhere between the oblique surrealism of Magritte and the radical grotesqueries of Linder, the collages of Sharon Gal have a lurid poetry all of their own. Their sometimes violent symbolism is matched by an acid humour and a deftness of touch ensuring each work remains a world in itself, full of intriguing details to engage the eye and get lost in. The present show was put together by curator Richard Ducker. Founder and director of the Fieldgate Gallery in Whitechapel, Ducker recently curated the Politics of Amnesia series at CGP. An artist himself, Ducker’s own practice ranges from text-based work to sculpture. This is the latest in a series of shows curated by him at Dalston’s Coffee is my Cup of Tea. "I have no agenda for the programme," he says, "other than to show work I like, by artists I like – some who may be starting out, some who haven’t shown for a while, and some who may want to show work that they don’t normally get to show, as it is not what the artist is necessarily known for." "I’m also quite interested in the idea of showing work in a non gallery space," Ducker continues, "where the art has to survive visually, and in context with the function of the space, ie a café in this particular case. In an era when spaces for artists, in particular at the lower end of the food chain, are scarce, this seems like an interesting way forward." The following interview was conducted exclusively for The Quietus. Sharon Gal’s exhibition Sweet Meat will be at Coffee is My Cup of Tea until 18 December (I would recommend the custard pudding). Richard Ducker: How did the collages come about? 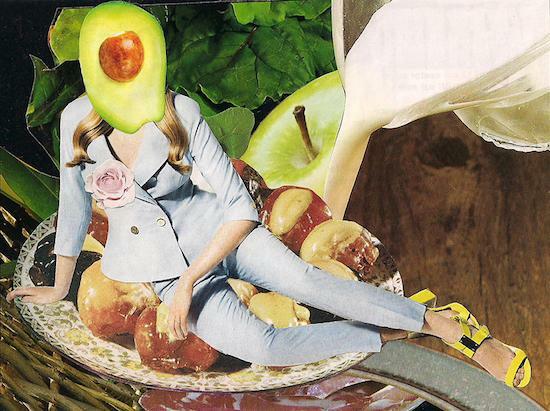 Sharon Gal: I've been making collages for years, originally making flyers and posters for gigs and some larger works in the 90's, inspired by surrealism and DIY /Punk aesthetics. RD: How do you see the collages in relation to your practice as a performer? SG: I like the form and have been using audio collages in my sound and performance practice. I've been working with recordings; my own as well as field recordings and found material and one set-up was utilising 4 or 5 Walkmans with various cassettes which I played using different speeds, running them forward and backwards. This is fun, surprising and unexpected, with various juxtapositions of text and sounds, manifesting differently each time and offering a range of possibilities and various meanings. I haven't used that set for a while although I am still using audio collage as part of my recorded material, bringing together different recordings to play one against another, adding voice and electronics as well. RD:That is interesting that they are connected for you, but of course sound and visual art are very different languages. With sound, unless it is the spoken word, collaging produces an abstract texture of experience over a time frame, while in the visual it has the effect of producing immediate unexpected associations, a new semiotic reading. How do you respond to these differences and how do you manage or articulate them? SG: I guess what I like in both the visual and the audio work is the emergence of new worlds and the ability, in particular in relation to the recordings, of merging and bringing together sounds across time and space. Like a ritual or an alchemical act of conjuring. With the visual work it feels more like a game a sort of a puzzle or a Jigsaw with no clear goal...Like searching, playfully until it feels correct, as if it reached some kind of resolution, like homecoming. It's a solitary game for one player. RD: When I use collage appropriation to produce my text works one of the things I find most important, and liberating, is both the distancing of authorship and the reduction of decision making. Do these factor in your thought process, and if so how? SG: I can see how that is so working with text and language. I also use something similar as part of live performances, working from books with cut-ups and utilising chance operations. Yes I can really relate to that sense of freedom where the narrative manifests through flow and action. It’s very liberating like speaking in tongues, as if you become a vessel for mysterious forces to appear and speak out. However with the recent series and in particular with Sweet Meat I decided to limit my choices, focusing only on figures (mostly fashion models) and situating these in either sweet or savoury food environments. So although it's a playful process I feel each piece of the collage is deliberated and considered and there is much more of a sense of authorship. It relates much more to the process of finding or discovering than to losing myself within a process or experience. RD: With the Sweet Meat collages in particular, it strikes me there are two potential readings: one as a critique of the body beautiful, a standard feminist critique of how women are seen meat through objectification, and another reading as a sort of Dionysiac celebration of pleasure or excess. Is that a fair reading, and if so can both readings sit together within the work? RD: The cafe is not obviously a traditional gallery, how did/do you feel about the work in a context like that? SG: This is the first time I'm exhibiting this collage series and I like presenting it in a place where actual eating takes place. It seems a suitable environment to digest and contemplate this work. I also like that it’s a place where people don't come to view ART and are able to experience it as part of life. Also the chance and randomness of who might see it and how it will affect them... It appeals to me.